Sometimes here at WordWenches, we have historical experts (like Dr. Josh King) as guests. Sometimes we have other historical authors (like too many to list) come visit us. Today we're fortunate to welcome a guest who combines both qualities, as well as being a frequent visitor to post. Kalen Hughes is the author of the acclaimed LORD SIN, which landed her on Amazon's "Hot New Releases" list as a first-time author. Her next book, LORD SCANDAL, will be released in June, '08. For more about Kalen the author as well as her books, please stop by her site: www.Kalenhughes.com. But today it's Kalen Hughes, specialist in historical dress, who's our guest-blogger. Since the age of three, she has been involved in various living history events from the Middle Ages to the Roaring 20s, and is an expert historical seamstress as well as a scholar of fashion and clothing. We're delighted to have her as a resource here this Wednesday, and next Wednesday, too. Let the questions begin! I was extremely excited and honored when the Wenches invited me over to talk about historical clothing. As many of you already know, historical costuming is a major hobby of mine. I spend oodles of time both studying and recreating (and sometimes wearing) the clothing of past eras. While my own novels are set in the late 18th century, today we’re going to take a look at the layers of clothing a gentleman would have worn c. 1812 (note, the layers are the same for the entire extended Regency era, roughly 1790-1830). To the right we have a fashion plate of just such a man. He's wearing the most fashionable hat of the day, pantaloons, top boots, and an open dress coat over a double-breasted wasitcoat. Please feel free to ask about other eras if you’re curious. In picking the garments for our hero I’m going to go with the most common versions, not the exceptions (but if you have questions about exceptions just ask!). Our hero is most likely wearing a relatively thick pair of stockings (most likely of cotton or wool). The curator at the Costume Museum in Bath says that for dress occasions they wore a cotton stocking under the silk stocking to hide their leg hair. Coats come in several varieties, and the terminology is confusing, and sometimes contradictory (esp. as the Victorians messed them all about). On most of the coats in our period (shooting coats excepted) the pocket flap is for decoration only. 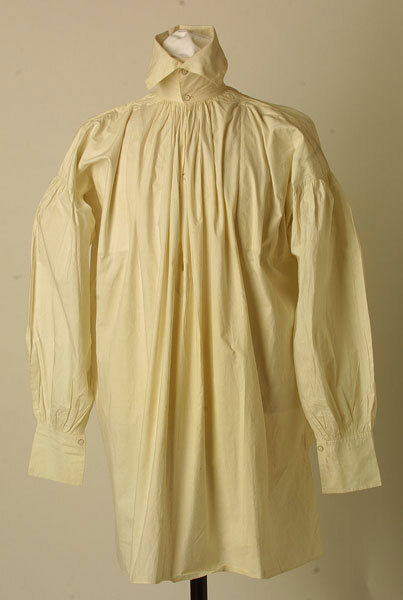 The actual pocket (if there is one) is inside the coat, usually in the tail (as with the extant example on display at the Jane Austen Center in Bath). This pocket was sometimes reached from the outside of the coat, and sometimes from the inside (which seems inconvenient, to say the least). Information on when the breast pocket appeared varies. 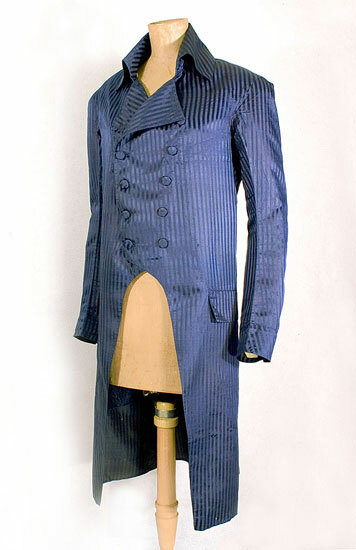 I’ve heard that Brummell invented them in 1813, but J. P. Ryan says she’s seen them on extant 18th century coats. Our hero is most likely in a dress coats (also called a tail coat). It has a cutaway front and tails in the back. It could be single or double breasted, and while most are made of wool (usually in a dark colour), extant examples in other fabrications (such as plaid linen) do exist. Blue coats are invariably shown with brass/gold buttons, all others with self fabric covered buttons. As for our hero’s “unmentionables”, let us put him into buckskin breeches. Though breeches, by the Regency, are considered old fashioned, buff leather ones are still commonly worn for “morning” or “country” attire. These are the jeans of their era. Most have a front fall, a flap that covers the front opening. This fall goes only from about hip-bone to hip-bone. The waistband buttoned, usually with 2-3 buttons, then the fall closed like a bib over the otherwise open front area of the pants. Belts were not worn. Pants of all types would have been held up by “X” crossed braces (suspenders). Waistcoats all button up the front. They could be single or double breasted (like coats) All the examples I’ve seen have a method of tightening at the back. Some have ties, some have buckles and straps. The front is the fancy, decorative part, with the back (and sleeves on some 18th century examples) being plain (just like a modern day suit vest). The interesting thing to note for Regency-ear examples is that they are square/flat across the bottom. Cravats are simply long rectangles of material that are tied around the neck. Mostly they were white, but colors were not uncommon among the working classes and the sporting and dandy sets. Though Brummell made the starched cravat fashionable, it wasn't jut starch that was responsible for the stiff nature of the Regency cravat: there is a horse hair pad hidden inside! The “Belcher” neckcloth (named after the man who made them fashionable, the famous pugilist Jem Belcher). These colorful cravats were also called peacock eyed. They are the origin of the cowboy bandana. I think our hero might be just enough of a Corinthian dandy to sport one of these, don’t you? Boots were the sneaker of the Regency era. Previously they had been worn only for riding, hunting, etc . Now, they’re part of proper morning (informal) attire. They come in many forms for men, There was the top boot (also called the English, John Bull, Jockey, or tall boot), Hessians (also called the Austrian or Hess boot). Some reach the knee, other examples only come up to the calf. Both lengths of boot are worn with pantaloons of varying length, and with breeches, sometimes exposing a good deal of stockinged calf.